Join Southern Cross or add immediate family over 18 to your policy through your work scheme before 31 January 2017 and you’ll receive a free $150 OPSM glasses voucher. * You’ll be able to use it to get a new pair of sunglasses or prescription glasses. Find out more about this great offer here. There’s nothing more important than your health and wellbeing. Having health insurance will give you the peace of mind that you’ll be able to access medical treatment when you need it. There are plans for different needs and budgets, whether it be for major surgical or day-to-day healthcare needs. *Terms and conditions apply, see here. More than 3,000 researchers, in 21 fields of the sciences and social sciences, were selected based on the number of highly cited papers they produced over an 11-year period from January 2004 to December 2014. The methodology that determines the who’s who of researchers draws on data and analysis performed by bibliometric experts from Clarivate Analytics. It uses InCitesTM Essential Science IndicatorsSM, the world’s leading web-based research analytics platform and a unique compilation of science performance metrics and trend data based on scholarly paper publication counts and citation data from the Web of ScienceTM, the premier web-based environment for scientific and scholarly research with the most accurate, normalized citation counts available. SIGNAL – the South Island ICT Grad School – is a collaboration between Ara Institute of Canterbury, Lincoln University, Otago Polytechnic, the University of Canterbury and the University of Otago. The grad school, funded by TEC, is also closely aligned with industry and is tasked with meeting the technology sector’s growing demand for highly-skilled ICT professionals. Dr Band comes to the role with 30 years of experience in global consulting firms, running large business schools, and directing and investing in technology-based companies. Dr Band describes his new role with SIGNAL as both a challenge and a great opportunity. “It is a challenge to New Zealand higher education to think in terms of – and to deliver – return on investment to New Zealand. And it is a huge opportunity for local businesses, students and educators to help us all make giant strides towards being a truly competitive knowledge economy,” he says. The interim chair of SIGNAL, the University of Canterbury’s Pro-Vice-Chancellor of Business and Law Professor Sonia Mazey, says to have someone of Dr Band’s experience and industry knowledge joining the SIGNAL board is a tremendous coup. SIGNAL stands for South Island Graduate Network and Laboratories. As well as producing highly-skilled IT graduates with work-relevant skills, SIGNAL will provide more effective pathways for graduates from IT education into employment. It will help grow New Zealand’s IT talent and knowledge to support business growth, innovation and productivity. SIGNAL is now open for enrolments across its four industry-aligned programmes: Educate, Shift, Xtend and Accelerate (www.signal.ac.nz), and will open its doors at two physical locations – The Granary in Dunedin’s burgeoning Warehouse Precinct and in the Innovation Precinct, Christchurch – in February 2017. EDUCATE: For all school teachers who would like to develop their knowledge and skills to teach the fast growing areas of Digital Technologies in schools, particularly computer science curriculum and computer programming. SHIFT: For graduates from non IT areas who wish to move into an IT focused career; and for recent graduates who want to augment their recently gained qualifications with IT skills to further their employment prospects. ACCELERATE: For entry level or early career employees with primary IT roles (recent tertiary level IT graduates) to improve and/or expand their proficiencies and capabilities in a work-based learning programme. XTEND: For experienced IT professionals who wish to move into a leadership role or extend their technical abilities. Delivery of SIGNAL programmes: Professionals enrolled in SIGNAL programmes will be engaged with businesses as part of their course of study. This engagement varies from company visits with Educate through placements, projects and internships with Shift to study whilst embedded in Accelerate and Xtend. On Wednesday 9 November the Undercroft was swarming with Year 10 ākonga Māori (Māori students) from various schools around Canterbury. It was an excellent day filled with activities run by UC Colleges. 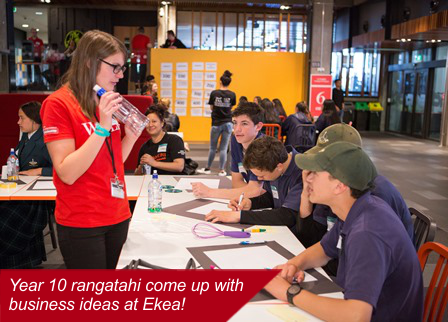 The purpose of the event was to welcome ākonga Māori onto campus and to inspire the idea of Tertiary education as a possibility as they enter into their first year of NCEA in 2017. The theme of the day was “E tipu, e rea, mō ngā rā o tōu ao…” (“Grow up and thrive for the days destined to you…”) a quote from the whakatauki of well-known political leader Tā Apirana Ngāta. It seemed fitting to follow his words as he was a UC graduate himself and the first Māori graduate to complete a degree at a New Zealand university. With many opportunities available at UC, ākonga Māori have the ability to grow up and thrive for whatever they choose. Ākonga Māori were connected with UC Tuākana (mentors from the Māori Development Team) and together they participated in college activities which were led by UC staff. Tuākana and staff were amazing, their enthusiasm on the day was infectious and you could see ākonga really getting involved, the competition for prizes was intense at each activity. There was lots of noise and laughter coming from the Undercroft, a sign of a great event. University of Canterbury Physics PhD student John Holdaway has calculated that the energy released by the M7.8 quake on 14 November accounted for more than 70% of the energy released in all New Zealand earthquakes of the past seven years combined – enough energy to power every home in the South Island for a year. 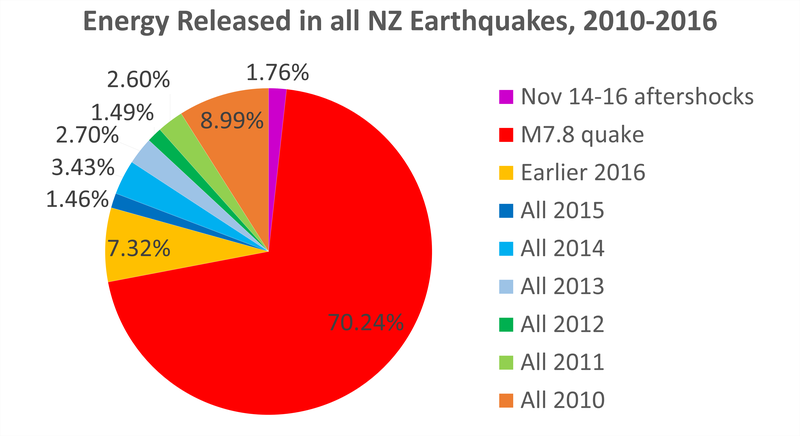 The M7.8 quake on November 14 accounted for more than 70% of the energy released in all New Zealand earthquakes of the past seven years combined. The energy released in two minutes during the M7.8 quake was around 32 quadrillion Joules – the equivalent of 8 million tonnes of TNT, or detonating 400 Nagasaki atomic bombs. To put that into perspective, the same amount of energy could power the city of Christchurch for three years – or every home in the south island for a year – or the whole of residential New Zealand for three months. It’s comparable to ten simultaneous Darfield quakes. The aftershocks alone from the first three days after the main event have already released another 800 trillion Joules – more energy than all New Zealand earthquakes in 2015. This graph was made using publicly available magnitude data for tens of thousands of quakes over the past seven years from the GeoNet database. The energy released in a large earthquake can be estimated from its magnitude using a formula developed by Båth in 1966, and the relative energy of an aftershock can be derived by comparing it to the main quake using another equation. To make the graph, I converted the magnitude for each quake to an energy value in Joules, then combined these energy values across different years. What you see in the graph is the annual sum of the energy released by tens of thousands of individual quakes. It’s worth noting that magnitude scale is logarithmic – a magnitude 5.2 quake is twice as powerful as a magnitude 5.0 quake, and a magnitude 6 quake releases 32 times as much energy as a magnitude 5 quake. Because of this, the second and third largest quakes in the 2010-2016 period – the M7.1 Darfield quake in 2010 and the M7.1 Te Araroa quake earlier this year – are the most visually apparent in the graph after the M7.8 quake. If the data for 2009 were included, the M7.8 Fiordland quake would approximately match the size of the M7.8 Kaikoura quake. We were fortunate the Fiordland quake was centred in a relatively remote area; we were not so fortunate with the most recent seismic activity. The 22 Feb 2011 Christchurch quake is not particularly prominent on the graph, despite being very damaging in a small local region. This is again due to the logarithmic magnitude scale – at M6.3, it released about 180x less energy than the M7.8 quake. The reason that the Christchurch quake was so damaging despite its relatively small magnitude was because of the combination of several unfortunate factors. Firstly, the hypocentre was very close to a major city and situated at the extremely shallow depth of 5 km. The fault also produced an unusually high peak ground acceleration – 2.2 times the force of gravity, one of the highest values ever recorded for an earthquake. It also combined uncommonly violent vertical jolts with the more typical horizontal shaking. The combination of these factors was simply more than many buildings were designed to withstand.